Brian Hsu was gracious enough to allow us to run this Then & Now he ran on his urban diachrony blog. 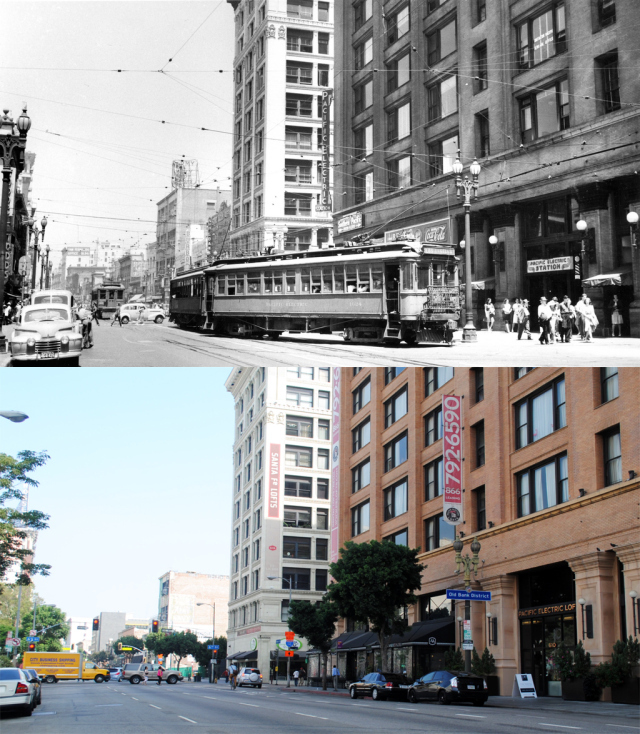 The top photo is looking north on 6th & Main in 1941 with a streetcar heading out of the Pacific Electric Building — once a major depot in downtown Los Angeles. The bottom photo was taken from the same location in 2012. Three of the big buildings on the east side of the street remain! Brian has more Then & Nows — check them out here. If you’ve enjoyed our Then & Now posts, then you are morally obligated to check out the Metro Library’s Historypin page, a sophisticated mapping tool that allows you to overlay historic photos with current street views. It is, trust me, epically cool. Here’s a Source post from last week explaining Historypin; check out the photo from Crenshaw and 60th on Historypin. Very cool. Photo credits: Top photo from the Metro Transportation Library & Archive Flickr stream. Bottom photo: Brian Hsu. The last photo at sixth and flower has misinformation. It was not the Pacific Electric that ran on sixth St. It was the L.A. Railway(Los Angeles Transit Lines) that changed to and operated trolly buses on fifth and sixth Streets. That’s not a “streetcar,” it’s an interurban car, a P.E. “Ten,” to be exact. Still says “Danger” on the sidewalk there to warn pedestrians about turning PE cars. Your right about it being a interurban and not a streetcar but the second car does not appear to be “red” but instead white or yellow. Now if this was in the Henry Huntington era when he owned both system I could understand the color. Duly noted, Mike Dunn. It seems that I was a bit sloppy in writing that post. The 5th and 6th Street streetcars were indeed run by LATL and not the Pacific Electric Railway, which I will correct. I personally refer to interurban cars as streetcars, but I will be more specific from now on.